I've been [unsuccessfully] doing research on the history of Catholic schoolgirl uniforms and it dawned on me during today's French open broadcast, that like the male and female private school uniforms, there is a disparity in length between male and female tennis wear. As you can observe from the above collage, the tennis skirts of the nymphet ball girls and Fiona Ferro, the 18-year-old French tennis player, barely covers their hillocks. Consequently, their spandex covered hillocks are often exposed when they bend over, run or serve. But the tennis shorts of the males extend to their knees. You can bet that those nymphet ball girls are causing a lot of nympholepsy among the French hebephiles. In the meantime, while I keep researching this issue, please share any sources on the history of Catholic schoolgirl uniforms and/or tennis skirts. And for your efforts, I'll kindly mention you in the burgeoning second edition of The Allure of Nymphets. Renaissance period Pope Alexander VI (1431 – 1503) was the Bishop of Rome from 1492 until his death. He is one of the most disputed Popes due to his adultery and nepotism. Alexander VI had a number of mistresses (and illegitimate children) but Giulia Farnese [Italian: Giulia la bella - Julia the beautiful.] was one of his most beloved. 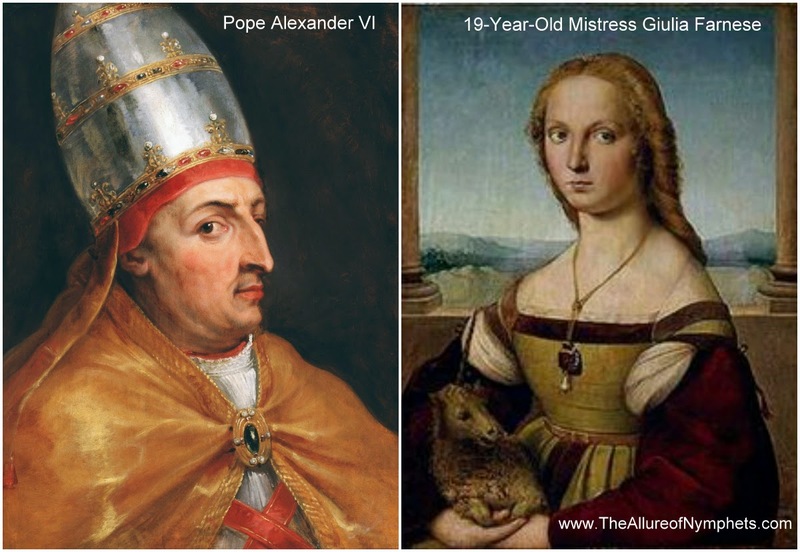 It isn't clear when their affair began, but when Farnese was nineteen and the Pope was sixty-two, she moved into a palace next to the Vatican with Lucrezia Borgia, the Pope's thirteen-year-old daughter. According to Durant's The Renaissance, Farnese was described as "The Pope's Whore", but she was good friends with the Pope's daughter. For some strange reason, Farnese was played by Lotte Verbeek, a thirty-year-old actress, in Showtime's adaption of the life of Pope Alexander VI, The Borgias.